Introducing Antioxidant-rich, vegan & 100% natural formulation Stretch Marks & Scar Lightening Cream which is powered by some of the most potent healing natural bioactives like Aloe Vera Leaf Juice, Safflower Seed Oil and Cocoa Butter. The WOW Stretch Marks and Scars Lightening Cream minimizes the appearance of stretch marks and scars arising due to pregnancy, weight gain or body building. This non-greasy cream can be applied on all body zones - thighs, breasts, tummy, hips, or lower back - that are susceptible to stretch marks. Does not contain Sulphates, Parabens, or Mineral Oils. Explore the entire range of Anti-Stretch Mark Creams available on Nykaa. 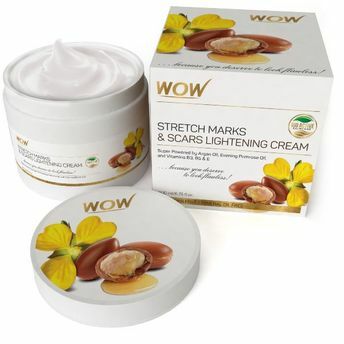 Shop more WOW products here.You can browse through the complete world of WOW Anti-Stretch Mark Creams .